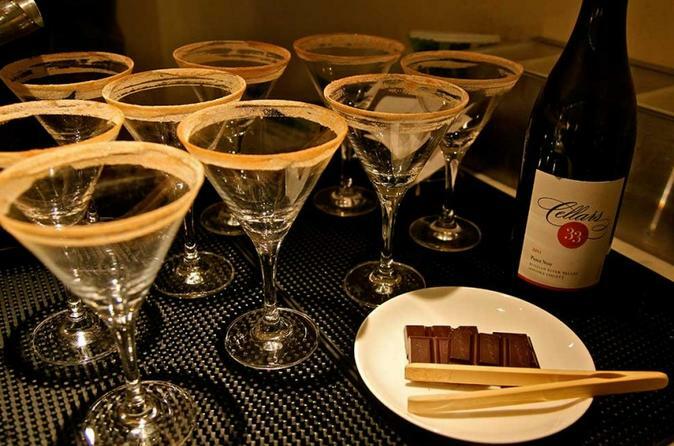 This San Francisco chocolate tour is specially designed for adult chocolate-lovers. Sip artisan cocktails and a wine flight pairing during your 3-hour sojourn through downtown San Francisco and the historic waterfront. You'll also receive a Chocolate Lover Card with discounts and VIP treatment at ten different chocolate boutiques in the city. This 3-hour walking tour takes you to seven different venues, where you'll indulge in generous chocolate tastings and pairings at each stop. Meet your guide in downtown San Francisco and set off with a small group capped at 14 participants, ending at Two Embarcadero Center on the waterfront. Your tasting itinerary includes: a craft cocktail pairing at an elegant downtown hotel bar; unshelled truffles from a ground-breaking, local chocolatier; a blind chocolate bar tasting at a specialty newsstand that carries 225 different bars from 15 different countries; fleur de sel (hand-harvested sea salt) caramels from a local chocolatier who showcases fresh, farmers market ingredients; a single-origin chocolate tasting from an award-winning San Francisco bean-to-bar chocolate maker; Parisian macarons at a charming pastry shop; and a wine and truffle flight at a hidden downtown French wine bar, including four varietals of wine plus four chocolates.